At Gen Con this year, another product with my name in it came out. I have a piece in volume 1 of the 2017 Gongfarmer's Almanac for Dungeon Crawl Classics. 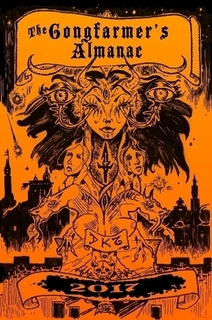 In addition to general articles and adventures like those in last year's Almanac, the 2017 edition provided a multi-author hex-crawl. This hex crawl is a campaignable landscape made of individual small adventure areas bound together only by one theme: they exist on the plane of Pandemonium, the source of chaos magic. My contribution is "Abyss of Automatons," which is my take on a robot underworld. Harley Stroh, the amazingly prolific DCC writer who created Peril on the Purple Planet, drew the map for mine! You can download all volumes of Gongfarmer’s Almanac 2017 from the Google Plus community’s Google Drive links below. If you want to order the Almanac in print, you can get the whole thing in one volume from Lulu (pricing is at-cost, simply covering materials and shipping). 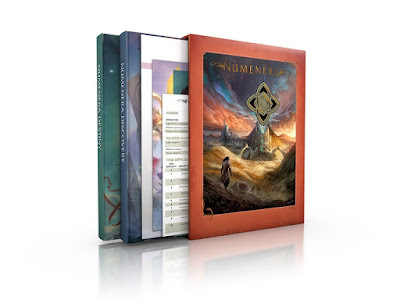 Monte Cook Games has launched their Kickstarter for Numenera 2, the revision to Numenera that they announced at Gen Con last month. I think it looks great, and I'm a backer. One fun thing that they're doing with this Kickstarter is asking the community of backers to contribute bits of fiction. Because part of Numenera 2 is the new Destiny book, MCG is using their Kickstarter updates to describe the town of Ellomyr, a place in danger of being attacked by bestial enemies. MCG encourages fans to describe how the town works to prepare its defense, and a high enough number of such descriptions on social media will give the town a bonus to its chances of survival. Oddity's father had told her to stay out of the way while the grown-ups prepare for the coming margr attack, but dangit, she had ideas that were bubbling up inside her and she had to let them out! Oddity tromped up to Auzenne the Builder, who had built the schoolhouse, and told her she should build a new village down the road, just as big as Ellomyr, that the bad guys can have fun attacking instead! “Then they’ll leave us alone!” Oddity said, smiling and nodding to indicate that she'd settled the matter. Auzenne patted her on the head like adults do and said she’d play with her later. Then Oddity tracked down Purple Golan the clothier, who had sewn her festival dress for her, and told him he should make margr clothes for everyone in town so the bad guys will think we’re just like them when they arrive. “Then they’ll leave us alone!” Oddity looked up at Golan hopefully, but all he did was act like her idea was a good solution and send her on her way. Oddity looked between Gurner and her father, and back again, then burst out with, “If we all play a super-mega game of 'hide from the Wind,’ the bad guys won’t be able to find us. Then they’ll leave us alone!" Oddity’s father picked her up. “I think it’s a great plan. Come on, Oddity. Lunch will give you the strength you need to start your training." Oddity’s father took her home, just as the Trilling Stone began to sing.